I really can't remember where I came across this recipe originally - you can find it on both the BBC and Guardian websites - but I know I read it in a book or newspaper somewhere. It's part of Dan Lepard's mission to bring decent bread to the masses. The idea behind these little loaves is that small, traditional English guest houses and hotels are able to make and serve their own fresh bread at breakfast, faster than you can say 'Mother's Pride Sliced White Loaf' (several hundred times over). The mix is simple. You can make a batch of the dry ingredients up and keep it for 'months on end' and then just weigh out what you need, add the wet ingredients, bake and after 25 minutes, you have tasty little soda bread 'muffins'. And it works. I used a third of the recipe's quantity - it says it makes six - and got three decent sized 'muffins'. You bake them in squares of baking parchment and I found that Lakeland's foil backed baking parchment worked well for this as you can mould it into the shape of the indentation in the tin and it doesn't spring back out like conventional baking parchment would. Fresh bread in 25 minutes? You butter believe it! It literally took less than five minutes to weigh and measure the ingredients. You combine to a sticky dough, spoon into the muffin tin, whack it in the oven and wait until that lovely freshly baked bread pervades the air. A few minutes of cooling, a sliver of lightly salted Lurpak (other butters are available) and you're in taste heaven. These are great for those times when only freshly baked bread will do and you don't want to wait around for hours while it proves. Yes, I know that the best tasting breads can take hours (or days if you're using a sourdough starter - something else I want to try!) 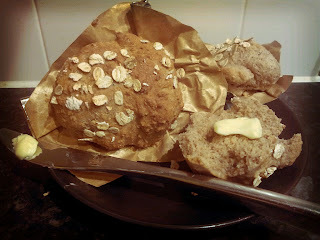 but this is the bread equivalent of the five minute chocolate cake in a mug that I made what now seems like aeons ago in the early days of this blog. I urge you to try them. They're a little on the sweet side so maybe not to everyone's taste. I'd love to know more about how much sugar is required to deliver the rise and texture and maybe look at reducing it slightly to suit my taste. But it's a good contrast if you use lightly salted butter. And if you're going to slather them with jam, the sweetness is immaterial. Another winning recipe from the delightful Mr Lepard!